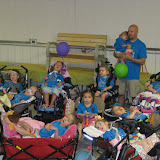 2012-08-13 Summer Times and DONATIONS NEEDED FOR CAMP!!! Once again, it has been awhile since I’ve updated. I’ve done some small updates on facebook here and there and then never get over to this blog. Feel free to “friend” me on there if you’d like to hear more often from us (Tina Maruszczak Krajewski). Ally seems to have recovered from her fractured right hip by wearing a spica cast/splint for almost 2 months to keep it stable and able to heal (she is out of it now). She only dealt with pain in the beginning and then it was just the “pain” of being stuck mostly in her bed while it healed. This summer has been pretty hot, so we have mostly been inside and I’ve been a bit down with no pro-active plan on how to prevent the next fracture since Ally’s bones are so tiny and brittle. Luckily we have an appointment on August 23rd with neurology and bone health to discuss some possible options. I’m really hoping Lurie Childrens will decide to do the pamidronate infusions on Ally since they are safely being done around the country on dozens of SMA kiddos with great success. We also have appointments coming up with pulmonary, orthopedic surgeon and physiatrist (?sp) to stay proactive with Ally’s cares and therapies. We’ve begun to have some cooler days and are starting to get out of the house again. 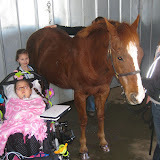 Some highlights have been going to the IL Abilities Expo and traveling to WI for a SMA gathering and Avery’s Race Event which raised money for Gene Therapy for SMA. 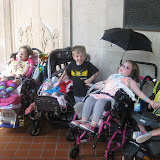 We also met up with some other medically fragile children at Lincoln Park Zoo. These families and ours are fighting to keep the MFTD Waiver in IL which provides our at home nursing. Some families are at risk of having all home nursing eliminated which could result in their children being permanently hospitalized and others may need to pay co-pays on any at home nursing (but nothing if we institutionalized our kids) Check out http://www.savemftdwaiver.com/ for more info. Melissa had a great time at Summer Day Camp at Shabbona Park this year and just started her second season of cheerleading. She is on a new team called the Chicago Razorbacks out of Shabbona Park. We are really happy that the age range is 6-11 with only the 8-11 doing official competitions. 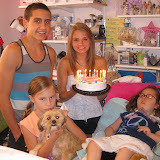 The younger girls are mascots and Ally will also be a mascot at some games with them from her wheelchair. This means a lot since its hard to see other kids her age practicing with peers and her off to the side with me. I think she will enjoy having a uniform and doing a couple of sideline cheers with others assistance. Melissa is getting really, really good at cheering and stunting. She’s soooooooo excited to be a flyer (which means she is at the top of the pyramids). Kristyn also continues to cheer on the Varsity team at Lane Tech College Prep. She will be starting her junior year and is even taking some AP classes. The exciting and scary news is that she is SIXTEEN and got her driving license. She can now bring herself to some of her practices and maybe even run a few errands for us. She can only drive when Billy is home with the car since the big handicap van is too intimidating for her. She spends lots of time with her boyfriend, Nick, who is truly a part of our family now. She’s been busy this summer with some school projects and a little babysitting too. If you ever need a babysitter and are in the area, please give us a call. She is good with infants and really all ages. Mia, our puppy, is almost 8 months old. She is close to being potty trained and is a very good dog overall. She will lay nicely next to Ally, but Ally isn’t her biggest fan and will just tolerate and look at her. Ally’s warming up to her, but has to get used to Mia’s kisses all over her face. Mia is also very active and loves to play fetch and chase with the rest of the family. She enjoys going on walks to the park to bring Melissa to camp or cheerleading. Billy and I have stayed busy taking care of the girls and house. He is a HUGE help when I’m low on energy, even after he works over 50 hours a week. I’m excited to say that he finally quit smoking and has been working out some, especially bike riding. I went once with him and may invest in my own bike in the near future. It was lots of fun since we rode along the lake, but we need to have more nursing to be able to get out alone together. I’ve begun to focus a little more on my health and I’m waiting for my GI appointment to have some more answers to some of my pain. That’s about everything, except we are looking for some help from family and friends. 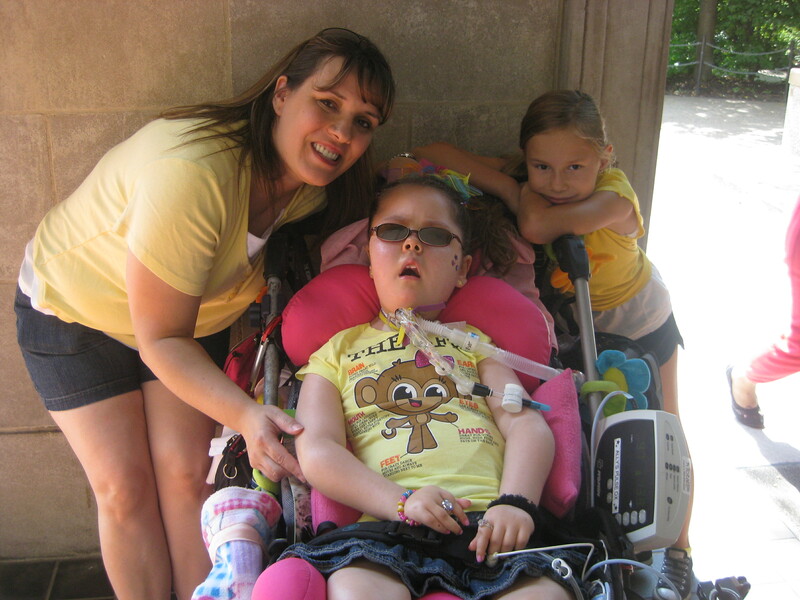 PLEASE make a donation to HELP Ally and our family attend an SMA family weekend at Center for Courageous Kids in KY September 7-9th 2012. 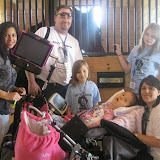 This will be our 3rd time attending the MOST INCREDIBLE camp in the states for medically fragile children. YOUR donation is needed to keep the camp flourishing and providing heart-warming experiences to children year round. Contact Tina (tina@angelally.com or 773-283-7211)if you are interesting in donating by check or collecting supplies for the camp. It is tax deductible. THANKS from the bottom of our hearts!!!! !